Bambi, Napco baby care brand in Saudi Arabia and Gulf region, congratulates Facebook contest winners of the ‘Mommy Protect Me’ Respiratory Syncytial Virus (RSV) awareness campaign. 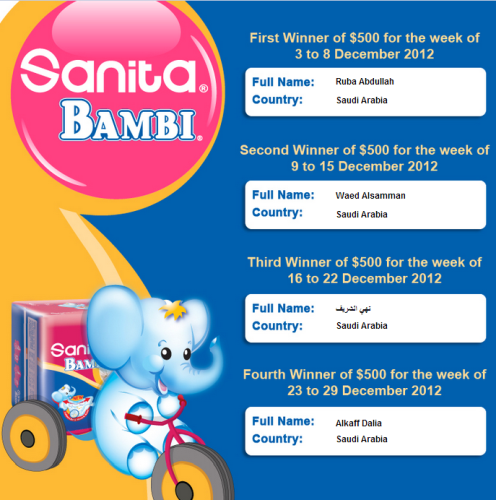 To promote ‘Mommy Protect Me’ RSV awareness campaign, Bambi launched an online contest on 'Bambi Baby Care by Sanita’ Facebook fan page from 3 – 28 December 2012 to engage fans and increase health awareness. Winners entered the draw by correctly answering weekly infant health-related questions, each receiving a prize of $500. As part of the integrated online and offline campaign, Bambi also aired a TV campaign promoting the motto “Ma3 Bambi Al Ma3rifa Himaya” or “With Bambi Knowledge is Prevention”. ‘Mommy Protect Me’ Saudi awareness campaign help families acquire knowledge about RSV symptoms and causes, in order to detect, prevent, and treat. Napco, leading manufacturer in Saudi Arabia, consumer division plants produce Bambi baby care products, including high-quality baby diapers and baby wipes. National Paper Company Ltd. (Jeddah), Napco Consumer Products Company (Dammam), Napco Riyadh Paper Products Company Ltd. (Riyadh) in Saudi Arabia produce a range of personal care hygiene disposables, household tissue and plastics products, and away-from-home catering and janitorial disposables.